In order for children to achieve in math, they MUST learn to memorize add and subtract facts, and not rely on their fingers to try to figure out the answer. At last, there's a book to solve that problem! 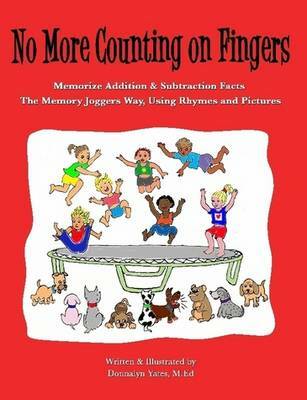 Donnalyn Yates M.Ed, teacher and memory expert, developed a successful system using pictures and rhymes along with a clapping game, and found children quickly developed instant recall. This is a book for children to read, color the pictures, and clap out rhymes. Since it's a fun activity, they want to repeat it over and over. And the best part, it appeals to every child's learning style. Try this fun rhyme for the picture on the cover! 7 plus 9 is 16. Jumping on a trampoline. 16 minus 7 is 9. Dogs are waiting a turn in line! This method has been tested in schools with amazing success and is now available in book form.